Designed to meet the household requirements of 60335-1 the KAS series with its wide operating temperature range up to 80°C, and start-up temperature of -40°C, is suitable for both domestic and industrial applications. The encapsulated board mounted power supplies do not need a ground connection and are available in 2W or 4W power levels. 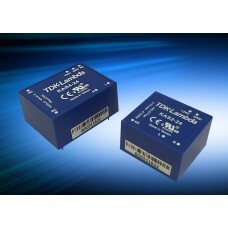 The KAS series provide an off-load power consumption less than 0.3W and Class B EMC performance. Designed to meet the household requirements of 60335-1 the KAS series with its wide operating temper..